The blog’s first post is headlined Fire Department Preparedness and it was written by Ken Kuntz. Ken Kuntz is a Fire Studies Specialist with the National Fire Academy’s Administration and Delivery Branch. He is the Project Officer for the Major Fire Investigations-Technical Report Series project which provides reviews of select/significant incidents to identify salient lessons learned to be shared with the fire service and allied groups and organizations. USA.gov has a collection of many of the government blogs. And you can read the Fire Service’s full release after the break. 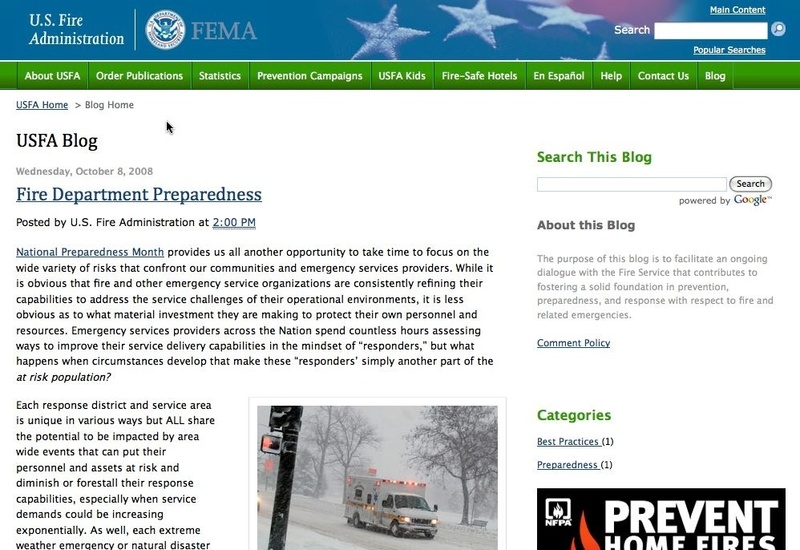 EMMITSBURG, MD – The U.S. Fire Administration (USFA) today announced the launch of an interactive blog on its Web site at USFA.DHS.gov. This blog will serve as a tool for the Fire Service to share comments, ideas, and success stories about fire prevention, preparedness, and response in America. In turn, USFA will post videos, outreach materials, and other helpful tools while charting feedback. USFA employees will contribute to and moderate the blog, including staff from the National Fire Academy. Their breadth of experience will provide unique perspectives on public education, research, data collection, and training issues. The first post discusses fire department preparedness for extreme weather emergencies and natural disasters, and how these events can place personnel and assets at risk, diminishing response capabilities. Future posts will cover topics such as how the rising cost of fuel is affecting fire and emergency services departments, college campus fire safety, how to get fire prevention messages into local news stories, residential sprinklers, and firefighter health and safety. The USFA blog can be found at blog.usfa.dhs.gov. Good luck to the Fire Service.